Many students reflected on moments in their lives when everything was going according to their desires. Many shared experiences on vacation with family, hanging out with friends, or the perfect moment on the field playing their sport. We used this and other stories to examine specific verses in Moses 7 as they relate to the lives of the youth. Moses 7:21 mentions that “in process of time (Zion) was taken up into heaven,” meaning that Zion is something that comes as a process, not an event. Over small incremental changes we become more like the Savior. Through His grace we can become like Him and emulate His example. Although Enoch lived in a time filled with war and bloodshed (Moses 7:16), he found a way to establish a righteous people. So too can the youth motivate each other and themselves everyday to bring to pass a Zion culture among themselves and their families. By making small decisions each day, they bring about great change. We used the example from the life of a Western Oregon softball player to illustrate this concept. When Sara Tucholsky, a senior from Western Oregon, hit a home run in a game – while rounding first base she tore her ACL. 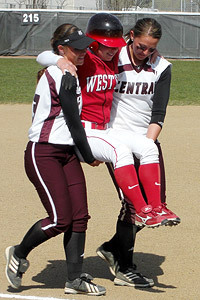 With the help of Mallory Holtman, and Liz Wallace from the Central Washington team, she was able to cross home plate. Mallory and Liz had to carry Sara to each base, having Sara touch each base with the foot from the uninjured leg. This is a tremendous story of sportsmanship, sacrifice, and love of the game of softball as well as humanity. When we start to see others as Heavenly Father sees them, then we can have Zion. Following this video I asked the students this question and had them respond in writing in their journals: How can you build Zion in your sphere of influence? What will you do differently as a result of our discussion here today? Tomorrow we will see how they responded and what course the students will chart for themselves. This entry was posted in Old Testament and tagged Enoch, ideas to teach LDS youth, Moses 7, seminary relevance, seminary teaching ideas, sportsmanship, Zion. Bookmark the permalink.